With the PP490, two basically unmodified Epson Stylus Pro 4900 printers are in operation. Digital Information to introduce the all new PP490 inkjet double-sided print system, an unprecedented print concept for double-sided, high-end output in Epson quality at Photokina 2012. The PP490 is a newly developed inkjet system for fully automated, double-sided printing of sheets up to the DIN A2 format. It is capable of producing high-grade photo book pages, art reproductions, color proofs, point-of-sales prints, and other commodities with superior inkjet quality. The double-sided printing process is based on two Epson Stylus Pro 4900 printers. The PP490’s brilliant image quality performance is complemented by an easy and accurate sheet guiding mechanism allowing for an exceptionally precise registration between the front and back of the pages. Designed to meet the needs of photographers, photo studios, service providers, print shops, labs and prepress services, the PP490 by Digital Information delivers unsurpassed excellence in print quality by relying on the proven capabilities of the Epson Stylus Pro 4900 printer. Epson’s print technology with its Micro Piezo print heads and UltraChrome HDR ink is unrivalled in the industry. With eleven dyes, the printer covers unparalleled color space. In addition to CMYK, Light Cyan and Light Magenta, there is a further addition to the palette consisting of Matte Black, two hues of gray, green and orange. A gently operating conveyer belt transfers the printed substrate. 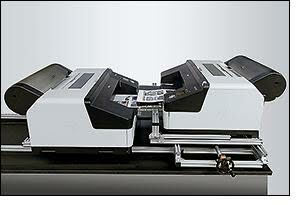 The PP490 works with inkjet paper sheets coated on both sides. The recommended papers have been fully tested on the system and officially certified by Digital Information. When printing on the front side, the sheets are fed to the Epson Stylus Pro from its original cassette. Upon completion of the front side, the handling device’s motor-driven conveyer belt automatically passes the sheet over to the second printer’s original feeder for printing on the back side. 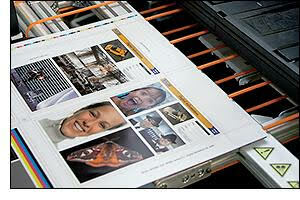 When the printing process is complete, the PP490 deposits the double-sided printouts into a collection tray. The use of the Epson Stylus Pro printers’ existing paper feeders results in an easy and safe process for damage-free paper transport. To drive the printer through RIP, color management, and workflow, Digital Information has developed control software with an interface for ensuring file transfer in the printer-specific Epson ESC/P2 file format. As both printers continuously produce, the PP490 performs as a true and reliable production system for double-sided print products up to the maximum sheet format of DIN A2. Please visit Digital Information at Booth #E30 in Hall 4.1 and at Epson Europe’s Booth #B013 in Hall 2.2 at Photokina in Cologne, Germany, September 18 to 23, 2012, to see for yourself the new PP490 in operation.